Ready for a new unmissable Premier League campaign? Looking for the best predictions ahead of the start of the season? Who will win this year? Here are our Outright Betting Tips for the 2018/19 Premier League, best odds and no deposit free bets! Few teams have dominated the Premier League in the manner that Manchester City did last season. They finished 19 points clear of second placed Man UTD and also broke a number of records, including most points, most goals and the longest-ever winning streak. The Citizens should be even stronger next season with the addition of Leicester City star Riyad Mahrez and the return of Benjamin Mendy from a season long injury. Pep Guardiola's team is simply too far ahead of the rest of the pack coming into the new season. Liverpool were one of the most entertaining sides in last season's Premier League Along with Manchester City. The Reds finished fourth in the league standings and reached the Champions League final. Jurgen Klopp has strengthened in the right areas,bringing in Naby Keita and Fabinho in midfield, Alisson Becker in goal and Xherdan Shaqiri upfront. It might not be enough to make up the 25 point gap between them and Manchester City from last season, but it should be enough to finish as their closes rivals. Manchester United under-performed this summer and the situation at Old Trafford is becoming increasingly tense. Jose Mourinho is clearly unhappy with the transfer market, as the Red Devils only signed the unproven Fred in midfield and teenage full back Diogo Dalot. The Portuguese manager is one of the most backed option in the "Next Manager to Leave" betting market. It's not difficult to see at least two of the other big six (Arsenal, Chelsea, and Tottenham) finishing close to, or even ahead of Mourinho's men. Tottenham have been very quiet in the transfer market, but from Spurs’ point of view that’s exactly what they wanted. The likes of Dele Alli, Christian Eriksen and Harry Kane are still here and they are likely to improve their performance this year. Arsenal and Chelsea are both in a transitional periods under new management, Man UTD seem to be struggling off the pitch, so a TOP 4 finish for the Spurs is on the card also this year. Arsenal enter a Premier League season with a new manager at the helm, having finished in 6th spot and a full 12 points outside the Champions League places last. The Gunners sacked Arsene Wenger and appointed former Sevilla and PSG manager Unai Emery. The Spaniard has strengthened his defence with the addition of Stephan Lichtsteiner and Sokratis Papastathopoulos, and midfield with new signings such as Lucas Torreira and Matteo Guendouzi. Without Champions League football to focus on and some new enthusiasm under new manager, Arsenal could be the suprise package in the Top 4 battle this year. Chelsea begin new life under experienced Italian manager Maurizio Sarri, who took over from Antonio Conte on July. Italian midfielder Jorginho and Real Madrid Mateo Kovacic (on loan) are so far Sarri's only significant summer signings, while Nabir Fekir is a further target. Willian and Eden Hazard are likely to remain at Stamford Bridge, while Thibaut Courtois is expected to join Real Madrid. There are serious doubts about whether the Blues will have the squad depth to climb back into the top four. 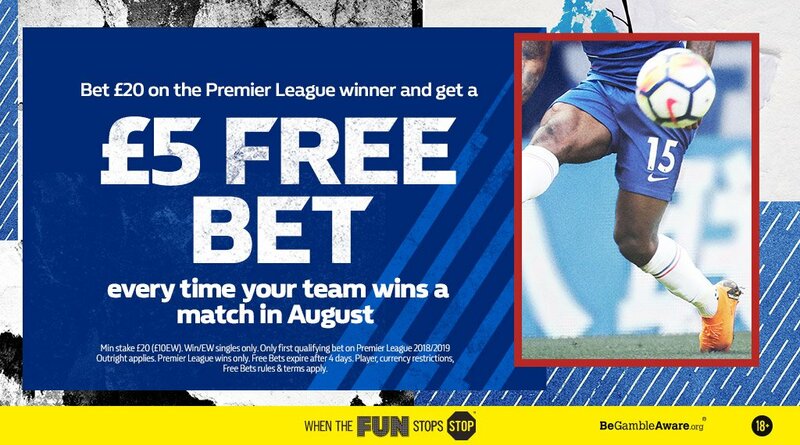 "2018/19 Premier League Outright Winner Tips, Odds & Free Bets"